US combat troops are due to pull out from Iraq's cities by the end of June. Moqtada Sadr has repeatedly called for a complete and immediate US withdrawal from Iraq. 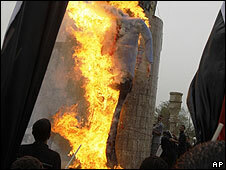 Protesters carrying Iraqi flags chanted slogans such as "No, no America - Yes, yes Iraq" as they thronged the streets and burned an effigy of former US President George W Bush. "God, unite us, return our riches, free the prisoners from the prisons, return sovereignty to our country ... make our country free from the occupier, and prevent the occupier from stealing our oil," an aide to Mr Sadr read, as part of a message from the radical cleric. Mr Sadr has not been seen in Iraq for several months and is believed to be in neighbouring Iran. His militia - the Mehdi Army - was badly beaten in fighting with government forces both in Baghdad and in the southern city of Basra. 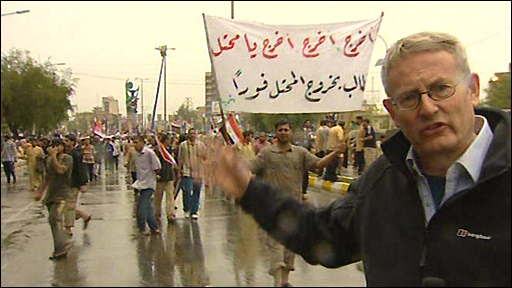 But the BBC's Jim Muir in Baghdad says the cleric is still showing that he has some political clout. His political followers did quite well in January's provincial elections and he is again showing that he has the ability to call tens of thousands of people out into the streets, our correspondent says. He confirmed his plans to withdraw all US troops from Iraq by the end of 2011. 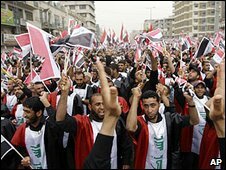 Mr Obama has said he wants US soldiers to leave Iraqi cities by the middle of summer this year and wants most of them to be out of the country altogether by the end of 2010. A smaller number of military advisers and support staff would remain in the country until 2011. Levels of violence have been generally declining in Iraq but this week has seen two bombings in the mainly Shia Kadhamiya area of Baghdad, after 34 people died in apparently co-ordinated attacks on Monday. Attacks by insurgents claimed more than 200 lives in both February and March. Some US military and Iraqi government officials have privately expressed concern that the violence may again rise as US troops are pulled out.